Roast pork for Sunday supper at Myriad Gastro Pub. Photo courtesy of Myriad Gastro Pub. By Dana Eastland. Bernalwood reports that the former home of Emmy’s Spaghetti Shack has a new tenant, after the apparently short-lived Aktun. It’s called ~CHICÁNO NUEVO~ and comes from Bernal local Abraham Nunez (formerly of the Emmy’s bar and St. Mary’s Pub). The food is inspired by Southern California, with a particular focus on Nunez’s Chula Vista roots. That means Baja-style fish tacos, three-cheese tamales with chile masa, and queso fundido. Plus, Nunez plans to stay open until 3am on weekends. 18 Virginia Ave. at Mission, 415-583-7641. It looks like there is a new gyro spot in Noe Valley, called ~LAZEEZ~. According to Yelpers, there are Mediterranean staples, like hummus, shawarma, kefta, and falafel in a casual, clean space. There are a few seats, but it’s mostly a takeout scene. 3915 24th St. at Sanchez, 415-923-8545. 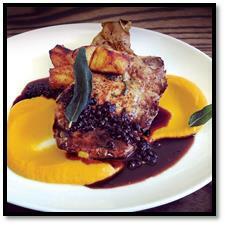 ~MYRIAD GASTRO PUB~ is now offering Sunday Supper on Sunday evenings beginning at 5pm. The three-course, prix-fixe menu will change weekly and will feature seasonal, home-style dishes like bacon and cheddar gougères, roast pork with butternut squash purée and huckleberry demi-glace, and vanilla-currant bread pudding with bourbon caramel sauce for dessert. The menu will vary in price from $30-38 per person. 2491 Mission St. at 21st St., 415-525-4335. As of this Saturday November 7th, ~OFF THE GRID~ is back at Justin Herman Plaza on Saturdays, to celebrate the holidays. From 11am-2pm until January 2nd, a rotating selection of five food trucks will be in the plaza, keeping ice skaters, holiday shoppers, and anyone else well fed. Justin Herman Plaza, Market St. at Embarcadero. Back in July, we reported that the former Marina location of Udupi Palace had been taken over by a new owner, Emin Tekin, who planned to open ~KOBANI MEDITERRANEAN GRILL~ in its place, along with a location in Berkeley and an unnamed additional San Francisco location. Tekin is also in the family that owns the former Hayes & Kebab, and has been helping his brother relaunch that location when construction on their old location is complete. Now, it appears the additional location mystery is solved: Chowhounds and their Hungry Onion brethren are reporting that Gajalee, the coastal Indian restaurant in the Mission, has closed. Planning documents in Tekin’s name suggest that he is remodeling there and plans to open a third Kobani in the former Gajalee. We reached out to Tekin, but haven’t heard anything back yet. More details when we get them! 525 Valencia St. at 16th St.
Hoodline reports that there’s a new tenant in the former Andy’s Chinese restaurant in the Inner Sunset. It’s called ~KE’S SEAFOOD BBQ~ and comes from owner Randy Quan, a Hong Kong native. The restaurant has grills at each table, but instead of hoods, they use high-tech “smokeless” grills that take the smoke away, below the table. In addition, all of the grill options are seafood, and Quan says he uses many of the same seafood suppliers as high-end sushi restaurants to ensure that everything is fresh. 1358 9th Ave. at Irving, 415-742-4877. Starting this Sunday November 8th, sister restaurants ~LA CICCIA~ and ~LA NEBBIA~ will be open again on Sundays, making your weekend a whole lot better. Lunch is now available at ~COCKSCOMB~ Monday through Friday 11:30am to 2pm. The menu includes a bacon-wrapped hot dog and a pork belly and fried clam sandwich, both served with freshly fried potato chips. Plus, their drink menu is available for especially liquid power lunches.